I NEED TO...find an easier way to report on IT progress. 85% of executives want more data from IT. Get all the data you need automatically with Xtraction. With Xtraction, Harris Health System generates custom reports faster than ever. For too long you've battled with a complex reporting tool. Been forced to skip between different applications with built-in reporting interfaces—then knit the data together manually in spreadsheets. The result? Ugly, dull, flat reports that put everyone to sleep when you present them. And, you're not alone. Do IT asset managers, security admins, service desk managers, and operations managers all share your pain? Suffer no longer. This is IT reporting, dashboards, and analytics on steroids. Reporting across IT is a challenge. You need a way to grab dozens of data sources from dozens of systems, overlay them, and make them look fabulous. View and share business-critical data. Make decisions based on accurate data...not based on who's loudest. Explore data to unlock hidden value. Find lost assets, a new service opportunity, or vulnerable devices. Present only what's important to each team member or executive and stop cluttering your life. Don't wait in line for days to get a custom-coded report built. Do it yourself in minutes. Get one view, one dashboard...or one chart on that dashboard! No need to open each IT application anymore. Cross-reference data from multiple systems easily. See the big picture, the little picture, or...as much of the picture you care to see. 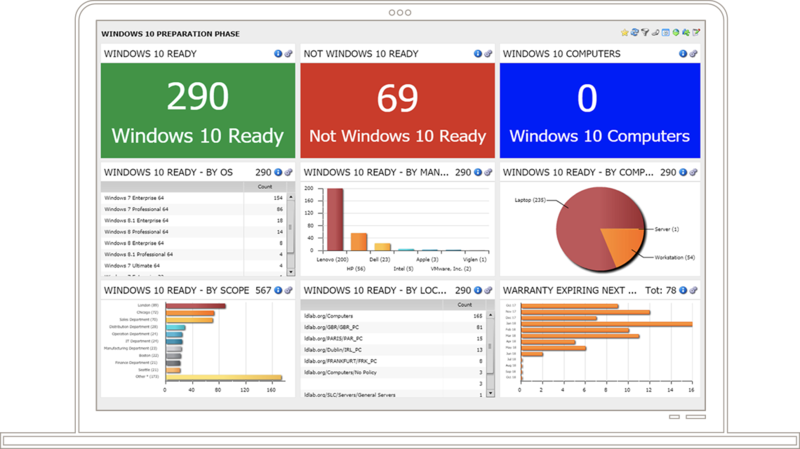 View high-level, business-aligned dashboards at a glance with red/amber/green IT metrics and financial impact. View current IT status, track performance, and assess risks to take action now and plan future resources. Xtraction provides simple IT reporting solutions for a wide range of IT vendor systems, like those in the ITSM, ITAM, and Security space. Choose a vendor-data source or sources, select the output format, then simply drag and drop to create the reports or dashboards you want—no coding or complex commands. We've done the hard work for you. You don't even need to be using another one of our products. It makes us sad, but you can still use Xtraction with other vendors' IT systems. Web-based, self-service IT reporting, designed with the user in mind. With Xtraction, we’re all about the easy actions. Designed with the user in mind (and not a reporting junkie that loves to code), our easy-to-use, self-service reporting and real-time dashboard features provide a new level of situational awareness that your other standard tools don’t offer. Quickly view data over time, drill down with a click, and even see the underlying data record. It’s all at your fingertips. Take a closer look at the features that will make your life a little bit easier. You'll be rocking and rolling and dragging and dropping on the SAME DAY Xtraction is installed. This isn't some bulky system that requires weeks of implementation. Get going and get the data right now. Get real-time filtering capability to focus right down on a particular data point. Quickly spot potential threats, spiraling costs, or an out-of-compliance device before it's too late to take action. Sometimes a chart isn't good enough. You need to know the specifics. Dig deeper into your charts and graphs easily and even see the underlying records to make decisions. Xtraction has connectors to many of the solutions Ivanti offers, as well as to products from vendors like BMC, Flexera, VMware, Symantec, Microsoft, and dozens more for service management, contact center management, asset management, endpoint management, and developer bug tracking. The list is endless. Don't just analyze data after the fire is out. Instead, see the data, the problems with the associated cost, and more—in real time. Plus receive alerts automatically. The interface is child’s play. You can just drag and drop to create your personalized and totally custom view from anywhere. 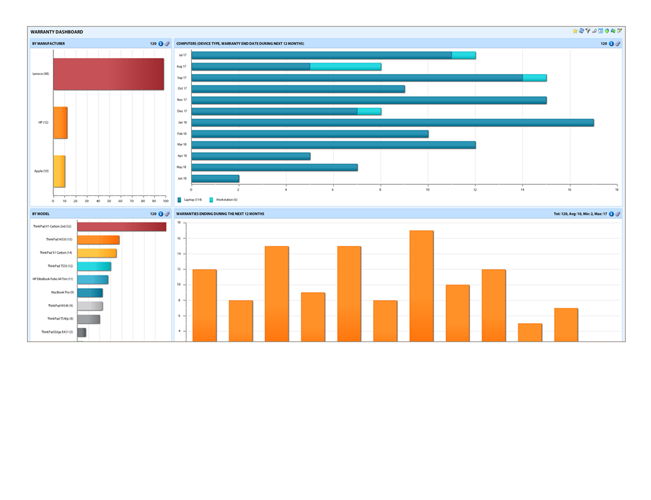 You access only the data relevant to your role and view it presented as reports or dashboards.